Overall, ASRock Phantom Gaming X Radeon VII 16G graphics card is equipped with AMD Radeon VII - the world's first 7nm gaming GPU, and 16GB large capacity 4096 bit HBM2 memory, to provide a powerful and comprehensive performance for gamers and professional creators with the latest process and technologies. The bundled activities of the three AAA games also bring a higher added value. From this point of view, ASRock Phantom Gaming X Radeon VII 16G graphics card is undoubtedly an excellent choice in the current flagship graphics cards. It seems nobody wants to bother with custom design. Good for them. We need competition. Nvidia's getting greedy. So... all of these "customs" are literally just sticker swaps, is that right? Well, AMD stated no partner cards, then powercolor showed a version with their cooler on it......... who knows. I'd rather have this site (any site) reach out to AMD and see if they can get a real answer than copy/paste news about a sticker change. Vega56/64 were on hold for awhile before custom designs came out. Erm no, PCB are different in AIBs, this card is the same as Sapphire, Power Color-All reference. They should release a version with a waterblock factory installed. Probably some manufacturer will, sooner or later. 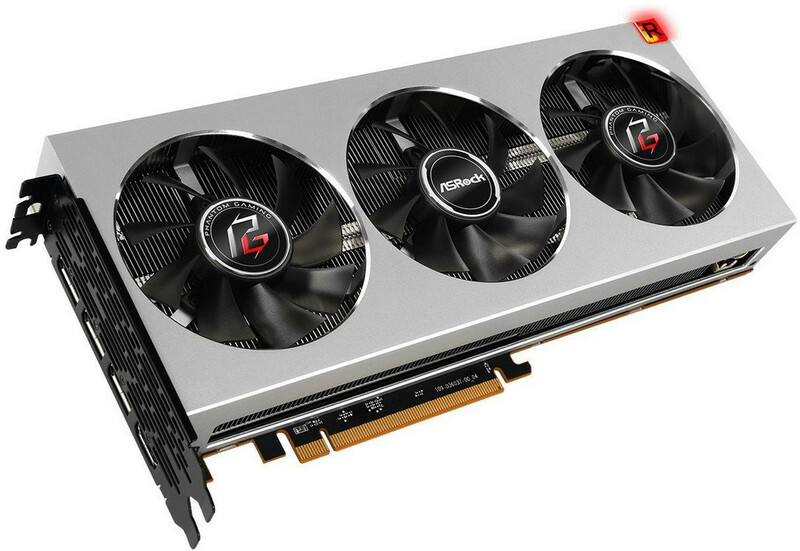 As did R9 290 series. The hairdryer was the only solution if you didn't want to wait for few months. And R9 Nano/Fury X didn't have customs at all (at least not on TPU GPU database), only the normal Fury had. Did not know ASrock got into GPUs. Dunno if I'd trust the quality. Have only ever had mixed success with their boards. And they literally made "very quiet in idle" a minus. so, R&D comes down to replacing fan stickers nowadays. good. keep on hating Nvidia, at least at the end of the day they have a lot to show for their work. No difference from FE cards from Nvidia which came out before aftermarket cards from AIB's but nice attempt at trolling. Not sure when you last had one but for the last 4-5 years they have been top notch, before that it was a mixed bag however, I believe that's when they were the budget friendly sub brand of Asus. I buy Asrock over Asus these days. ASRock clarified the info with Forbes: " What I've been told -- and I confirmed this twice over the phone and again via email -- is that in Europe, ASRock has decided not to sell Phantom Gaming graphics cards commercially. They won't appear in online or brick-and-mortal PC retail shops. They are only intended for miners and industrial use. Except Vega II isn't really much of a competitor to the 1080Ti, it loses out to it in most games. The 2080Ti is 20-30% faster than the 1080Ti, which is about standard for a generation upgrade. If you're an AMD fan or just flat out refuse to buy Nvidia then the Vega II is going to appeal. For everyone else it's another fail from AMD. Yes we can talk about driver support to improve perf, but waiting 3 / 6 / 12 / 24 months for those gains to come doesn't sound appealing. The problem AMD has is they need a solution which will make people switch from Nvidia, the Vega II is not that solution. * Power is high and its noisy due to the air pressure being pushed. That I agree with. Hopefully custom options will rectify this. * Raytracing? Completely useless at the moment and not required. This isn't a deal breaker by any stretch of the imagination. * Looking at TechPowerUp reviews along with another 10-12 other sites, the Radeon VII isn't all that far off from the RTX 2080. And the VII does very well in DX12 too. Driver optimizations coming, because that fast 16GB isn't being fully utilized as it should. * AMD did admit this card was re-purposed into a Gaming Card. Not sure why they did this, but there is clearly a "SMALL" market for it. Mainstream Navi will be the real deal IMO. It's not all doom and gloom, its simply giving people a choice. Do you want the most powerful Radeon card ever built to date? Or do you want to go with an Nvidia equivalent i.e. RTX 2080 that costs a little more, but justifiable for its performance bump over the Radeon VII. Seriously, AMD is coming out with a brand new GPU design. Its being tested as we speak, but its not ready for launch. So this is what we have to go with for now. The 1080Ti is on average 5% faster over the Radeon VII. And no the Radeon VII is not a fail. Radeon VII faster by % over Nvidia & Vega..
And there's 10-12 Review Sites that comply with above results. Including UserBenchmark's Comparison by actual users. These Benchmarks are similar all across the various review sites for the Radeon VII.